Acer redefines mobile connectivity with the Aspire one, a netbook (or mini-notebook) packed with fun and powerful computing features in a diminutive 8.9" form factor weighing as little as 2.2 lb. Aimed at business professionals, students and world travelers, it offers a choice of operating systems, wireless connectivity and Internet access. It's time to simplify your life with the Aspire one. A great choice for business travelers who like to travel light as well as those who need extra-long battery life, this affordable ultra-lightweight Acer Aspire One (LU.S040B.162) weighs just over 2 pounds and is packed with a 160 GB hard drive and Windows XP operating system. It has a vibrant 8.9-inch CrystalBrite WSVGA LED backlit display, integrated webcam for easy video chatting, and Intel's latest mobile processor--the Atom. Offering a cool deep blue hue, the netbook's smooth surface is comfortable to touch, and it's accented with distinctive details, such as the attractive orange hinge ring. A great choice for light-packing business travelers, it comes with Windows XP Home, a 160 GB hard drive, and a 6-cell battery for up to 5.5 hours of battery life. The integrated webcam at the top of the screen's bezel provides easy access to video chatting. Weighing just 2.17 pounds, the stylish Acer Aspire One goes anywhere with you. Designed especially for mobile devices, the 1.6 GHz Intel Atom processor uses a brand new design structure new hafnium-infused circuitry--which reduces electrical current leakage in transistors--to conserve energy, giving you more time away from the wall outlet--up to 5.5 hours with the included 6-cell battery. Other features include 1 GB of installed RAM (1.5 GB maximum), 54g Wi-Fi networking (802.11b/g), multi-format memory card reader, multiple USB ports, and built-in email, web browsing, and digital media applications. It comes preinstalled with the Microsoft Windows XP Home operating system, which offers more experienced users an enhanced and innovative experience that incorporates Windows Live features like Windows Live Messenger for instant messaging and Windows Live Mail for consolidated email accounts on your desktop. The Intel Atom processor uses a brand new design structure that packs in 47 million transistors into a single chip sized at just 22mm (0.87 inches), and it uses just 2.5 watts of power--less than 1/10 of the 35 watts used by an Intel Core 2 Duo processor--for excellent battery management. This 1.6 GHz Atom N270 processor also includes a power-optimized front side bus of 533 MHz for faster data transfer on demanding mobile applications and a 512 KB L2 cache (which temporarily stores data). This version of the Aspire One comes with a 160 GB hard disk drive (5400 RPM), which offers enough to room to hold a digital audio library of over 26,000 songs and still have room left over for movies, games, and a large collection of software. This Serial ATA (SATA) hard drive also quickens the pace with a higher speed transfer of data--akin to Firewire and USB 2.0. Because of its size, the Aspire One does not come with an integrated optical drive, but optional CD/DVD read/write drives can be connected to the laptop via one of the three USB ports, enabling you to create your music mixes, burn movies to DVD, and more. The 8.9-inch screen has a WSVGA resolution (1024 x 600) and support for up a 262K color depth. Video is powered by the Intel Graphics Media Accelerator 950, which uses shared video memory with the main memory. Acer's CrystalBrite display technology guarantees the best possible visual experience by preventing the diffusion of surrounding light and internal ray. Compared to normal TFT LCDs, Acer CrystalBrite technology is able to read color coordinates more accurately, thus minimizing distortion and creating high-fidelity colors in all environments. This notebook includes an integrated audio card with Microsoft DirectSound compatibility, and it includes two stereo speakers. 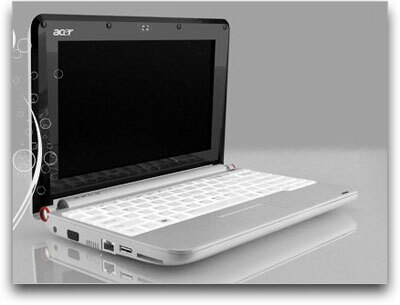 This package contains the Acer Aspire One notebook PC (AOA150-1126; LU.S040B.162), rechargeable 6-cell lithium-ion battery, AC adapter, and operating instructions. It is backed by a limited warranty for parts and labor for one year from date of purchase. 1.6GHz Atom N270 Processor. 6 Cell Battery. 1GB DDR2 SDRAM. 160GB hard drive (2.2 pounds). I have never experienced such a negitive customer experience as I have with this product. I am currently serving my country in Afghanistan. I ordered this computer and when it showed up it was defective. I worked with the on-line support folks and even spent my own money calling back to the customer support line. Never once was I told that the item could be replaced with a new one. I spent an entire week trying to fix the computer by taking directions from the Acer support techs. At first, they said I had to update "Flash" a new bios to the computer. This was a new computer and it already needs the bios replaced? I updated the Bios and this did not fix the machine. Then they wanted to send me a CD to reload the software. Well, they obviously did not do their homework because the computer does not come with a CD ROM drive. So here I am in the middle of Afghanistan with a computer that keeps shutting down on it's own....right after I start it. Overall, the netbook package is nice, fairly slim (although I've seen slimmer). This is a point that will be up to personal preference, as many will complaign about the keys being too close together, or the touchpad being too small; however, my personal observation is that the keys are not significantly smaller, and mine came with a mini-mouse, easily fixing the touchpad problem. The speed is quite average amongst most netbooks with comparable specs. The wireless works quite well; at first I was dropping connection every minute or so, but after visiting the Acer website and updating the driver, it worked fine. The built-in webcam is a nice touch, works great with skype, and the quality isn't too shabby (obviously not HD quality or anything of the like, but overall quite smooth, better than most I've used). The built-in speakers are ok for the size, but headphones would be much better. Battery life is quite good, mine averages 4 hours with use. Start up is quite fast; takes me about 20 seconds to load (without an anti-virus currently installed; I'm sure that will easily slow down performance). Much software had to be removed out the of box (McAfee, 3rd party software, etc), but it was nowhere near as bad as I thought it would be, about 20 minutes of uninstalls, no messing with the registry or the like. XP runs smooth, have yet to try Windows 7, although I'm told it runs fairly well. Office 2007 runs smooth, Word, Excel, OneNote, and all. It includes 3 USB ports, which fit items fairly snug, but no problems (would have been nice to have a firewire port). The included VGA out is almost vital. The screen has good quality, a little small for thos who are used to larger fonts, but for me works nice. I have fiollowed the Ultra Mobile PC, Netbook and One Laptop Per Child (OLPC-XO) tech space for years now. 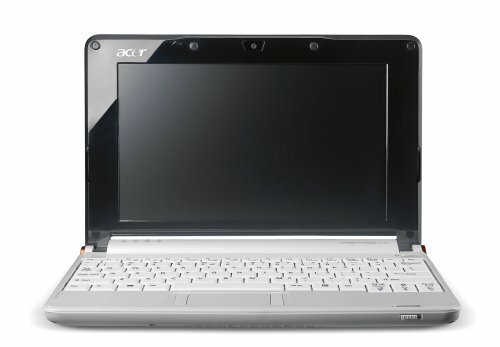 I even purchased an OLPC - XO last year and had some fun with it - but the Acer Aspire One is a real computer. I've had mine for a week now and I am extremely pleased with the purchase. I have loaded it with all my applications and have not had any issues - Office 2007, Safari browser, Juice podcast RSS, even DragonSoft Naturally Speaking (what I consider a computationally intensive app - full disclosure: I had to use a USB sound card that came with my headset to get a clean voice-to-text sound quality - the sound card built-in was choppy). Even Skype video calls and Facebook Video mail worked GREAT with the built-in camera and mic. As far as animation graphics, Crayon Physics (a really cool game) runs fine. I even use it with my company's Citrix and LiveMeeting Java-based service clients - with NO Issues. Performance seems to be about a P4 at a fraction of the power consumption. It's hard to believe it only costs $319! I'm seriously considering buy a second one for the family - 'cause it's hard to share. The three USB ports and two card readers are great - Acer added the external video port, so you can plug a full size monitor, keyboard and mouse in and use it as a desktop. I do highly recommend the 6 cell battery - I get 3 to 4 hours depending on what I'm doing. 1. I have always had small WinCE type clamshell or hand held PocketPC, but they always had limits that I had to accept - with the Aspire - there are no limits - it's a fully functioning PC the size of a trade-paperback book and weighing in at 2 pounds. There is no special UI, no special software. Wireless internet was painfully slow, and after repeated attempts to contact Acer's customer service (CSV) and their numerous hangups, I returned the product. We have two other laptops in the house, so I was able to verify the severe underperformance of the wireless connection on the Acer netbook multiple times with the CNET online bandwidth test. The Acer CSV line may as well have been non-existent. After I ordered the product and encountered difficulty contacting CSV, I began checking online reviews of this product, and that's when I came across numerous atrocious feedback on Acer's CSV. From all of the positive feedback on Amazon, this product appears to be superior to its competitors, but watch out for when you experience problems that require the help of Acer's CSV; you will find their service as welcome as a fart in a phone booth. I will NEVER travel without it! It deserves an A+ in reference to its portability, its easy usage while traveling, and its indispensability while abroad for the month! I've had the Aspire One for about a month now and really love it. I carry a great deal of camera equipment with me every day and my bag already weighs over 15 pounds so I was looking for a decent little all purpose machine that wouldn't weigh me down even more. The Aspire One fits the ticket perfectly. It slips right into the front of my back pack and off we go. I've been mainly using it as a web device (surfing and blogging) and a note taker and it has preformed very well. The small keyboard does take a little bit of getting used to but once you do it's very comfortable to type on. I would have given it 5 stars but for the shiney finger print laden surface of it that makes it look 'icky' all the time and I love the little switch on the front edge to disconnect the wireless, which was a great idea, but the switch is so poorly built that I know it's just a matter of time before it breaks off in my hand, catches on my clothing, or rips off completely in my bag. I suppose time will tell. 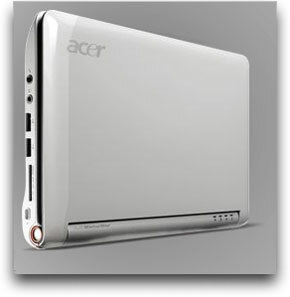 The Acer One currently on sale is great- small footprint, does everything I need. I bought it about a month ago for use at work, where the wireless networks are blocked, so I use a USB wireless modem device. No problem. But it absolutely will not connect to the internet reliably using WiFi. I spent about 6 hours troubleshooting, and no way will it connect to my home network that 4 other machines share happily. So, if you bought this needing Wifi connection, look for something else. 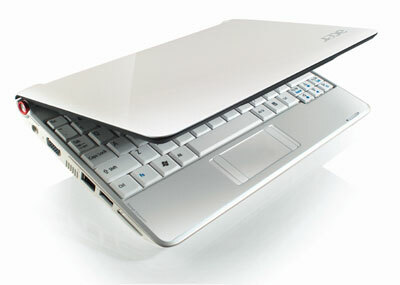 The problems have not been fixed by ACER, because this machine has the latest BIOS and drivers. Awesome bang for your buck! I bought this to replace my conventional laptop for daily portable use. I bike commute, so weight and size are always important issues for me. I was prepared for the many compromises of an relatively underpowered device, but I have been amazed by the performance. It boots as fast as my gaming tower, runs all my Office and web apps great, and has enough hard disk space to store my music and many ripped movies. I thought I'd miss the optical drive, but as it is not my sole computer, it's not an issue. About the only thing I don't like is the button arrangement around the trackpad. A minor issue, as I have a portable wireless mice I could use, but it isn't that big a deal. BUT it's desperately SLOW!! you can start several applications and go prepare yourself a coffee and then come back to see if they opened. even if you close all other windows. It's good for travel, word processing (a bit slow also) etc. but not if you like to work fast. the ATOM processor is slow. Aspire One and UNR = Awesome! There was no usable demo on display and all I had to go by for my purchasing decision were it's looks. I could not even touch it since it was inside a display case. I saw that the only model available was the version that came with XP and was okay with that. I'm not a Vista basher, but I'm certainly glad they did not try to cram it into this 1.6 GHz, 1GB RAM netbook. Without any research, I honestly thought I was purchasing a model with the Solid State Drive (SSD), but at 160GB, I later discovered it was a mechanical drive. Upon opening and playing around with the netbook, I was pleasently surprised at the quickness of the boot time. The 8.9" screensize is not bad for viewing text as I originally feared. Once I was able to get to the internet, I was able to surf without any problems. Typing on the keyboard took some getting used to, but typos were kept to a minimum. In fact, I tried an Asus EeePC (can't remember model) prior and I couldn't type on it as well since the keyboard was smaller than the AAO. The buttons on the touchpad were a bit awkward (and it still is). However, it is not detrimental to me since I usually use the tap-to-click feature of the touchpad. Because this was a netbook, I wasn't expecting a stellar performance because of the machine's modest specs and I was correct. I'm sure the culprit for the "sluggish" feeling was the fault of the McAffee anti-virus that came pre-installed. Nevertheless, XP did a fairly decent job so that I planned on keeping the OS and dual boot with a linux OS (I usually nuke the original OS partition because I dislike dual booting). After some research on a potential linux OS I decided on Ubuntu Netbook Remix (UNR) and installing it went without a breeze once I figured out how to put the installation image onto a USB drive. I have one word after trying it out. WOW! The applications are speedy and surfing the internet was fast! The layout of the interface is nearly perfect. As a netbook, I prefer layout of UNR over the traditional "taskbar-start menu-task tray" setup. Boot up time of UNR was about ~20-30s and hibernation/wake up was about ~15s. Even though UNR was created for netbooks in mind, it is still a full fledged OS just like the XP version that originally came with the AAO. I've never tried the linpus os that came with the linux version of this, but it's hard to imagine that it's anywhere close to what UNR has to offer. I am a student who purchased the Acer laptop three months ago, and within two months it wouldn't charge without me having to jiggle the AC adaptor. I got on the website and could not reach anyone on the phone number listed--the website itself is completely convoluted. I managed to track down a number and was told to send my laptop, which was under warranty, in for repairs. I had to pay the 20 dollars to get it sent out myself (they didn't pay, even though THEIR product was broken). I told them it was probably an issue with my AC adaptor; I even sent it with the laptop because I was told to on the phone. My comments were clearly ignored. It was sent back two days later with the same AC adaptor, claiming it was fixed. Imagine my disappointment when it was STILL not working, and I was further berated like a five-year-old on the phone when the people on the line were convinced I wasn't doing something right. Now that I've complained they're sending me an AC adaptor, which will take another 10 days to ship. This is perfect for me! I love my "baby computer" as I call it. I have had it about a month now and it's perfect for what I need. I write and blog a little too, and I can do that whereever I want to, as well as edit photos, etc. And because I have a bad back I love that it is not heavy! I haven't tried using anything but a flash drive, and do need to get a mouse for editing but the touch pad is easy to use for less involved work. Can't really say much about more technical aspects since I am not too knowledgable in this area - I may be on the forums asking questions one day.